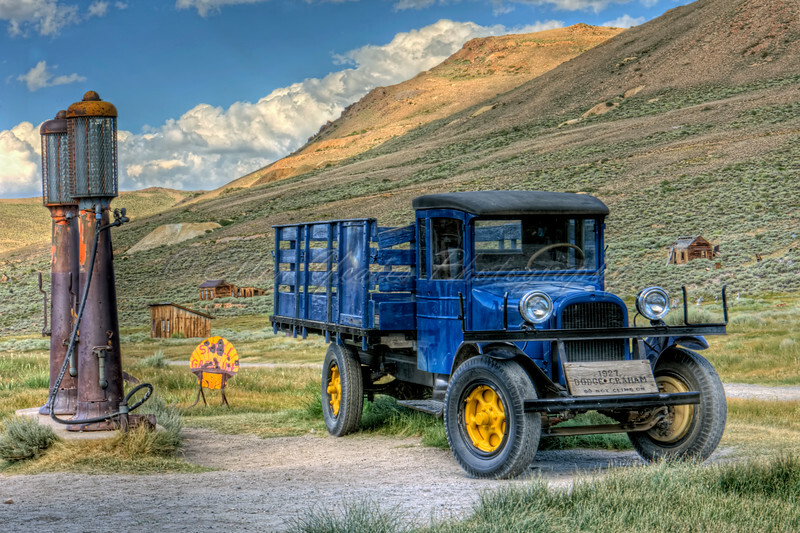 Bodie State Historic Park is a genuine California gold-mining ghost town. The town is named for Waterman S. Body (William Bodey), who had discovered small amounts of gold in hills north of Mono Lake. In 1875, a mine cave-in revealed pay dirt, which led to purchase of the mine by the Standard Company in 1877. Bodie is located in the eastern slopes of the Sierra in California, close to the Nevada border and Mono Lake (only less than 30 miles away). A 1927 Dodge Graham sits next to the old gas pumps. The bullet holes on the old "Shell" signs. Outstanding image and pp! Just love the color, the setting, the fact that you got all these old things in the same photo! Fantastic HDR! Love the colors and compositions! This is just outstanding! Rich color, fantastic detail, great composition, blue sky, and all very natural looking.